I've had this dress done for quite a while now. I thought that I wouldn't have a chance to take pictures of it until next spring/summer, since it is currently 39º outside. :) But our family decided to take a vacation in Hilton Head Island earlier this month and so I figured the beach would be a perfect place to take pictures. Here's the front. I'm standing on the steps up to the dunes house. We've been going to Hilton Head Island since before I was born, so these steps have a lot of memories attached to them! I used Butterick Pattern #5209, with (of course) some small alterations. I raised the neckline, curved the empire seam, rather than having it come to a point. I also made a different skirt, because I didn't want gathers at the waist, and I eliminated a few seams on the bodice. The fabric is 100% rayon. I got up early, did my hair and make-up, but I guess I could have stayed in bed, as far as the hair was concerned. It was SO windy that it pretty much looked like a mess as soon as I stepped on the beach! You can see a little more of the bodice detailing in this photo, though the busy print makes it rather hard to see the seams. The sleeve seam - I'm loving the angle of it! Neck-notch! Retro patterns are SUCH fun! So there's my latest creation! Lots of other outfits are swimming around in my head, so I'll be back with more sewing adventures sometime soon! Your dress is so cute! I love the 1940's styles and I'm in a sewing mood now! : ) Beautiful job! Your sister takes amazing pictures as well! It's awfully cute... I can't wait till I get my many other projects out of the way so that I can sew mine! (And find a pattern that I like... ughhh). oooo how lovely Tara! Yes, the lipstick is adorable, and the sand dunes and waves are beautiful! You have really inspired me to try and make things like this! they are so beautiful! good work! 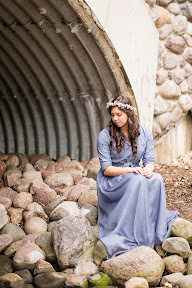 I love the pictures!Great job Kathryn on the photos and Tara on the dress making! This shoot looks like it was so much fun!! :D Great work to the both of you! Samantha - Oh good! It's always good to hear that someone wants to take up sewing! You should! Kathryn - Your dress sure is gonna be cute once it is made! Don't worry, you'll find a pattern....someday. And many many thanks for the photos. You're the best! Lily - YAY! Glad you like it! And yes, your approval is very much desired in these quarters because you're soooo amazing! :) The 40's week needs to happen as soon as it warms up (you know, next year *sigh*)! Maybe we could do it out of order and do a 1930's one in the winter, which would require me to make a 1930's winter outfit...hmmm... that sounds fun! BUT I have a few pressing projects over the winter, so I may not have any time to do it. Rats. Anyway, I'm just rambling. Thanks for the comment!! Elizabeth - Isn't the beach so pretty! It makes a perfect setting for basically any type of photo-shoot! Thanks for the comment! Laurelyn - :) It was very very fun, even in spite of full sun and wind! It's scrumptious! I admire your sewing skills on improvising the pattern! Thank you Dawn! I miss you loads! Could you do a tutorial on how to make/attach an over skirt for a dress that is already made? I am curious on how to do it, because I'd like to do it myself. I have a plain dress and I want to add a ruffly over skirt to it. That dress is d.a.r.l.i.n.g.! You all must be so crafty! Tara you look beautiful. And your dress is adorable too. :) Love the pictures. Kara - Thanks so much! just plain stunning!!! THAT is a dress I would love to have in my everyday wardrobe :-) well done!